If you want to enjoy incredible variety while losing weight through balanced nutrition, portion control, and hunger management with frequent and delicious meals, Nutrisystem is the way to go. It allows you to choose from 150 amazing meals and a range of meal plans for different dietary needs. The price per day depends on the plan you choose. To make it easier for you to figure out how much losing weight with Nutrisystem costs, we have created this simple overview with all the pricing details in one place. 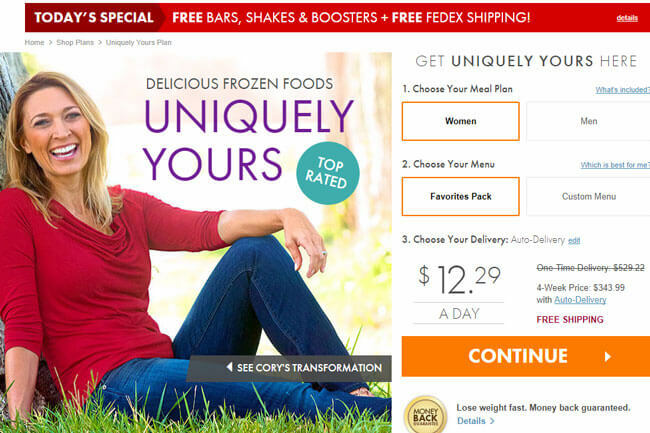 Nutrisystem’s standard set of meal plans includes the Basic, Core, Uniquely Yours, and Uniquely Yours Plus plans. All plans come in 2 versions – for women and for men – and allow you to decide whether you want to get the Favorites Pack – pre-selected meals and snack – or the Custom Menu – you pick your own meals. Diabetics and pre-diabetics can opt for diabetic-friendly versions of the Basic, Core, and Uniquely Yours plans. All meals available with these plans are designed in accordance with the guidelines for recommended sugar intake provided by the American Diabetes Association and American Heart Association. For individuals on meat-free diets, Nutrisystem has designed the Vegetarian meal plan. Versions for both men and women are available. 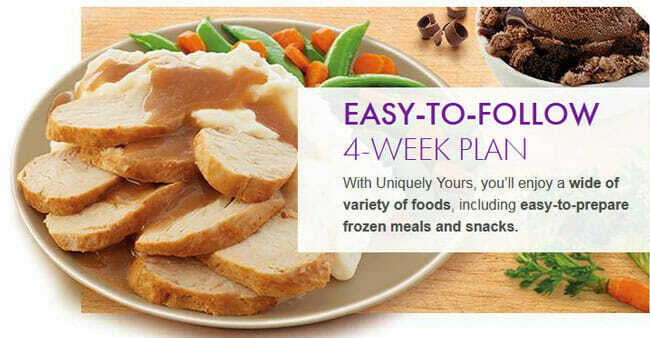 Below are the prices of all Nutrisystem’s 4-week plans. The prices vary depending on whether you opt for the women’s or men’s version of the plans, Favorites Pack or Custom Menu, and auto delivery or a one-time delivery. Men – Custom Menu: $349.99 per month with auto delivery; $499.98 with one-time delivery. Men – Custom Menu: $349.99 per month with auto delivery; $538.45 with one-time delivery. Men – Custom Menu: $389.99 per month with auto delivery; $599.98 with one-time delivery. Men – Custom Menu: $429.99 per month with auto delivery; $661.52 with one-time delivery. All plans come with free FedEx shipping and a money-back guarantee. In this section, we will explain what each Nutrisystem plan includes and highlight the differences between the plans. Both the Basic and Basic-Diabetes plans allow you to enjoy 4-5 meals and snacks per day for 4 weeks. Women get breakfast, lunch, dinner, and a snack while men get breakfast, lunch, dinner, and 2 snacks per day. The Basic and Basic-Diabetes plans only include meals and snacks, with no extras. The Core and Core-Diabetes plans include all the meals and snacks included in the Basic and Basic-Diabetes plans – 3 meals and 1-2 snacks per day. However, they allow you to choose from a wider range of meal options – as many as 100 menu items. Plus, they include unlimited support from dietitians and counselors and free online trackers and tools. The Uniquely Yours and Uniquely Yours-Diabetes plans include all the benefits provided by the Core and Core-Diabetes Plans – 3 meals and 1-2 snacks per day and unlimited support from experts. The only difference is that they provide greater menu variety than the previously described plans. They allow you to choose from over 150 menu items and freely mix and match frozen and fresh food items. The Uniquely Yours Plus plan differs from the Uniquely Yours plan in that it includes 4 weeks’ worth of shakes in addition to all the benefits included in the previous plan. You get 28 Nutrisystem Turbo shakes, one for each day of the week. The Vegetarian plan is similar to the Core plan. It includes 3 meals and 1-2 snacks per day and allows you to choose from over 90 meat-free menu items. Unlimited support from dietitians and counselors and online trackers and tools are included in the plan as well. It is important to note that no matter which plan you choose, your deliveries do not cover all of your weekly meals. In addition to the meals provided by Nutrisystem, you get to eat 4 Flex meals per week – meals you cook yourself using Nutrisystem recipes or meals you eat at a restaurant following Nutrisystem’s guidelines. You can choose when you want to enjoy a Flex breakfast, lunch or dinner. With Nutrisystem, your daily meals and snacks cost just around $3 per serving. They are surprisingly affordable and suitable for virtually any budget. Even when you factor in the cost of Flex meals that you need to prepare on your own or get at a restaurant, you may end up spending less money per week than you would if you prepared all your meals yourself. On top of that, shipping is free for all plans and if you are not satisfied, you can get your money back, as you are covered by the company’s excellent money-back guarantee. All in all, Nutrisystem is more budget-friendly than we expected and it allows you to enjoy chef-prepared diet meals without worrying about spending more than you can afford.